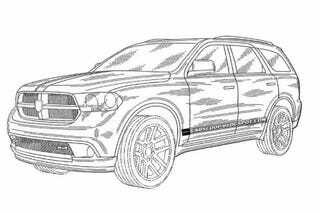 The next-generation Dodge SUV will probably be called the 2012 Dodge Magnum, instead of Durango, but whatever it's called these patent drawings show it's got a Ram nose, old Viper wheels and an Oldsmobile Bravada roofline. Since Fiat's locked down pretty much all corporate communications coming out of Chrysler regarding future products and plans since their big five-year plan, we don't really know much about the replacement for the Durango. It could end up staying badged the Durango or picking up the Magnum name that passed away with their excellent but eventually canceled large wagon.